If you book the extra day in camp we cross Knight Inlet and travel through Thompson Sound to the Kakweikan River and spend a day with Trapper Rick. 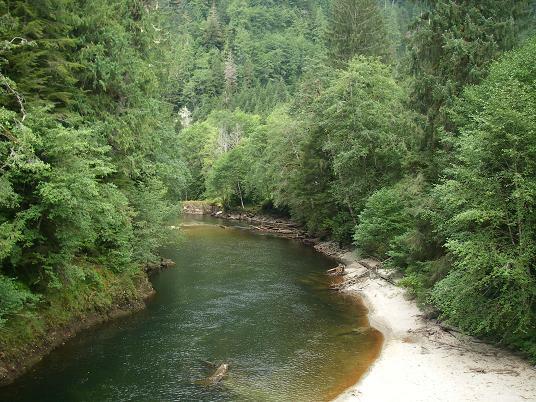 This river is located on the BC mainland and we travel by old logging roads to Rick’s cabin. Once we cross the river and start the short hike to Rick’s cabin the first stop is often an abandoned bridge, which provides an excellent view of the river and the spawning salmon in the river. The photo above is looking down river and the small flat area at the end of the portion of the river you can see is the “front yard” of Rick’s cabin. 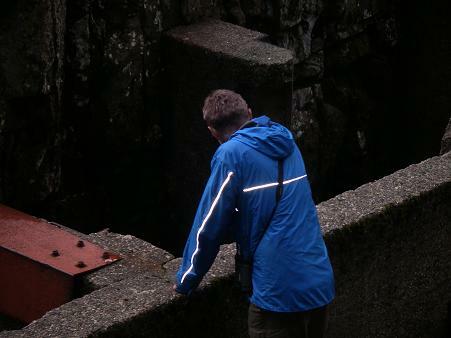 The photo below shows a guest looking into the fish ladder that bypasses the falls in front of the cabin. 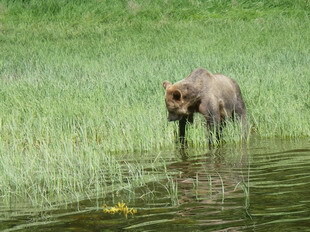 This is also the area frequently used by grizzly bears to fish for salmon. If bears are not present then guests may fish for salmon below the falls but while you fish one of the guides is always watching for bears as we do move when they arrive.